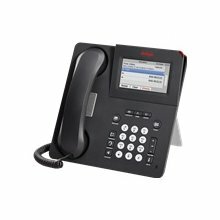 The Avaya 9621G IP Telephone offers power users a sophisticated business tool that is cost effective. The 9621G features a 3.7" x 2.1 color display, Touch Screen, Adjustable, tilting display, Speaker, Mute, Volume, Headset, Contacts, Home, History, Message, Forwarding, Volume & Phone buttons, and has separate volume adjustments for handset, speaker, ringer & headset. The 9621G is supported by Avaya Communication Manager 3.1.4 or later (H.323). SIP version supported by Avaya Communication Manager 6.0 with Avaya Aura Session Manager 6.0 or Avaya Midsize Business Template 5.2.1.